Gluten Free Christmas Cake (Dairy Free) | The Free From Fairy. 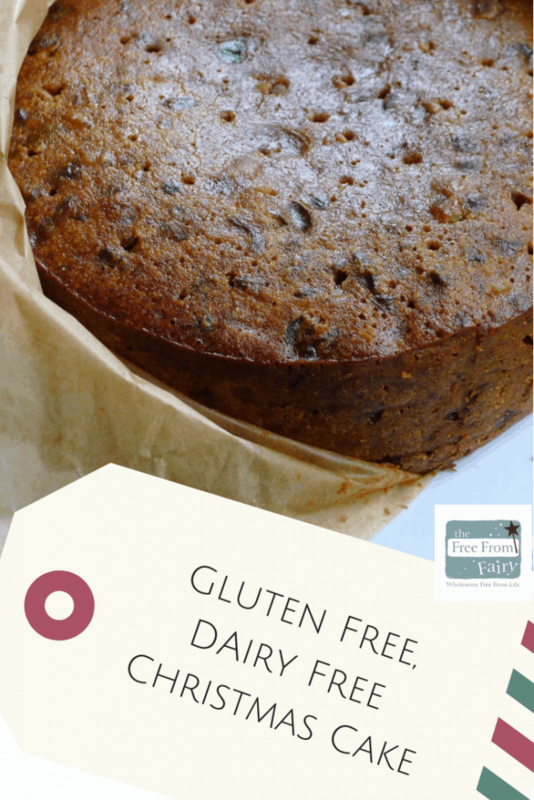 This gluten free Christmas cake can also be made dairy free. It has a lower sugar content than most recipes and is so simple to make. I can guarantee that nobody will know the difference. This week I seem to have been on fire! I think it must be due to all the inspiration I had at Mumsnet Blogfest last Saturday combined with a few days away from the family. Anyway, what it means is that I made our gluten free Christmas cake. It’s best to make it early for the tastiest cake. That way it gives you plenty of time to ‘feed’ the cake with your chosen alcoholic tipple. This makes it deliciously moist. I have also managed to write four blog posts, created two new gluten-free flour blends and five new recipes! I really have no idea what that is all about! Rest assured, it won’t last! Please don’t start feeling all inadequate on me (like I do when I read other people’s blogs about all the things they have been doing). This is my part-time job after all (and it won’t last)! Since posting pictures of the gluten free Christmas cake on various social media outlets I have been repeatedly asked what recipe I used so I thought I would quickly share it. 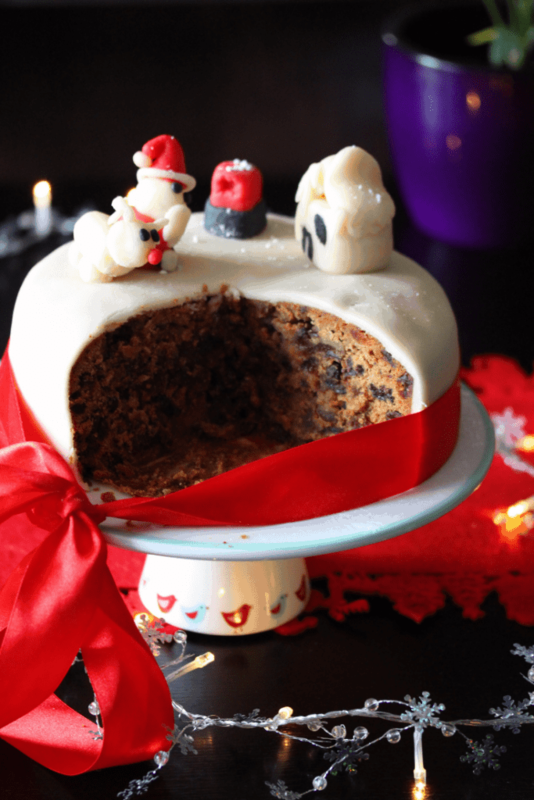 How do you make gluten free Christmas cake? I adapted this recipe on the BBC Good Food website to make it gluten free and dairy free. After soaking the fruits first thing in the morning I was super excited about the kids coming home and helping to make our special cake. ‘Roo’ and ‘Sunshine’ had other ideas. So my romantic dream of mixing up the Christmas cake together ended with me being spied on in the kitchen whilst listening to BBC Radio 6 Music for company. Oh well, I may as well get used to it! ‘Roo’ and ‘Sunshine’ never go along with my plans. I did manage to persuade them to come and give the mixture a stir and make a wish. I thought that would make a beautiful new Christmas tradition in the house. Pa! I am a ridiculous dreamer! For those of you, like me, who rarely bother with the ‘faff’ of lining a tin, you might like to visit Delia’s page on how to line a cake tin! You can find that here. 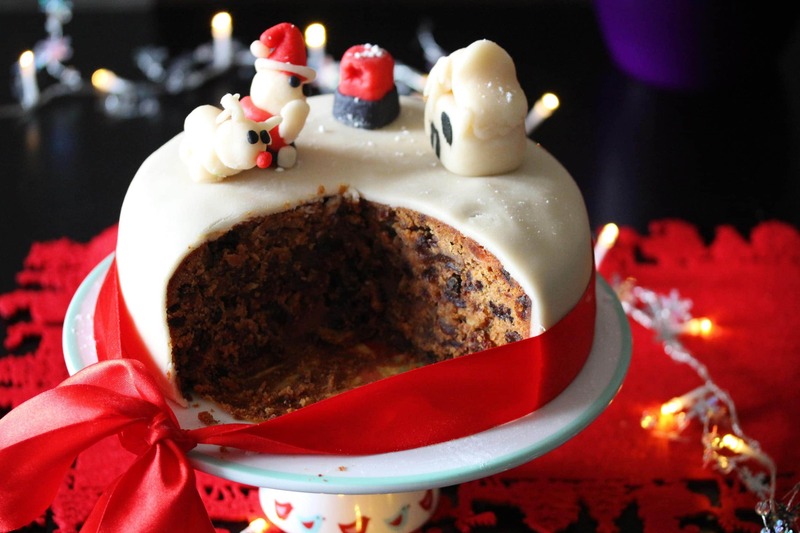 Do you plan to make a Christmas cake this year? I’d love to know if you make this. And of course, don’t just make it at Christmas. 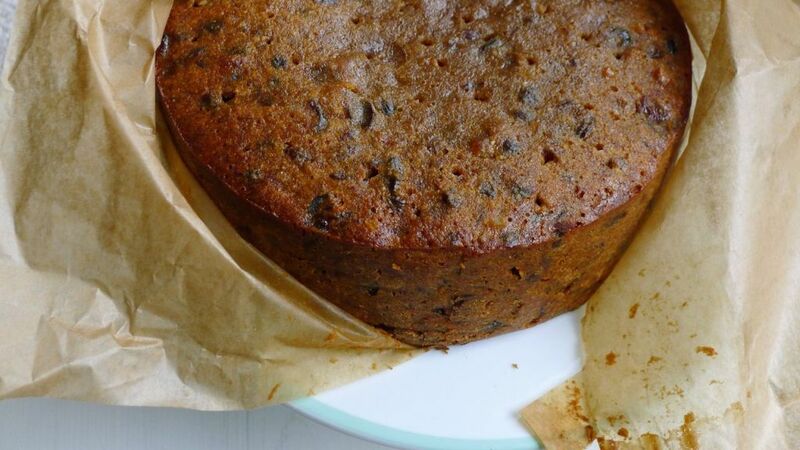 This recipe can be used any time of the year for a rich gluten free fruit cake. Place the mixed fruits (you could use what you have/want) into a large bowl and cover with 150ml alcohol or juice of your choice. Leave to soak for at least 6 hours. Line a deep 20cm round cake tin with 2 layers of baking parchment. Wrap 2 layers of baking parchment around the outside of the tin too and secure with string (see link below for how to do this). Once the fruit has soaked, take a huge pan (I used my pressure cooker) and melt the coconut oil and stork, along with the sugar. 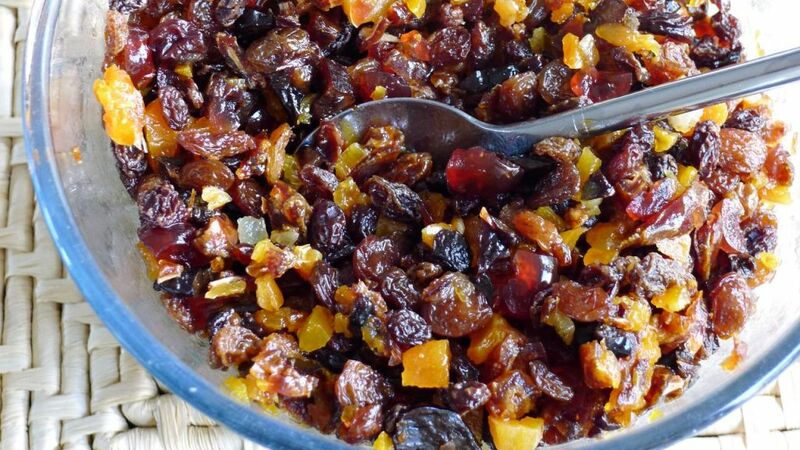 Once melted remove from the heat and add the spices, orange and lemon zest and juice, vanilla extract and soaked fruit. Stir well. Add the remaining dry ingredients and stir well again. Finally add the beaten eggs and stir to combine. Place the mixture in your prepared tin and place in a pre-heated oven at 150 degrees (130degree fan), gas mark 2, for 2 hours. Remove from the oven, spike all over with a skewer or fork and drizzle with 2 tbsp of your alcohol or juice of choice. Leave to cool in the tin before wrapping in the baking parchment and storing away in an airtight container. I plan to 'feed' my cake every 2 weeks with 2tbsp cointeau. Use whatever alcohol or juice you like, but this will make sure it is lovely and moist (and boozy!!!). Remember to wrap back up and store in the container after every 'feed'! Leave the cake for a week without 'feeding' it before icing to make sure the icing sticks. « I Need A New Job! Thank you for sharing – it looks delicious, bet you can’t wait to crack into it! Hoping I will get round to making one this year. Unbelievably I’ve never made a Christmas cake!! 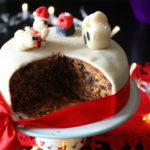 It is so funny with Christmas cake! As I said I had only ever made one before this and that was for a raffle…so I too have never made one for us! I think that is because my mum always makes one and the kids never eat it so I never saw the point. I see it as a sign that I am aging that I have made one this year! The kids say they don’t like fruit cake but I reckon they will like this one once it has its marzipan cover! Hey! It looks like that turned out REALLY well!! Bet you can’t wait to tase it!? Hi Vikki, I really can’t wait to taste it! I am trying to resist the urge to sniff it even else i don’t think it will make it!!! 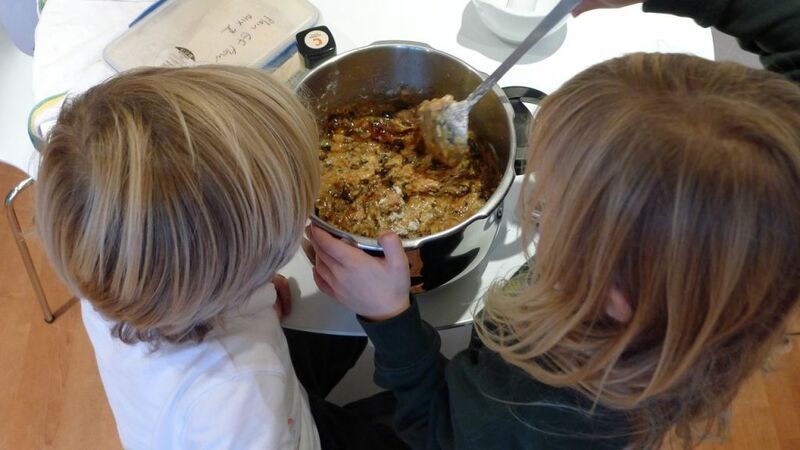 I’d really like to try this out with my kids this week (daughter already dairy free but going to try gluten free to see if helps) – but I really hate marzipan! Do you reckon it would be alright without anything on it?? I’ll probably blog about how we get on with it if that’s ok and then I can link to you?? 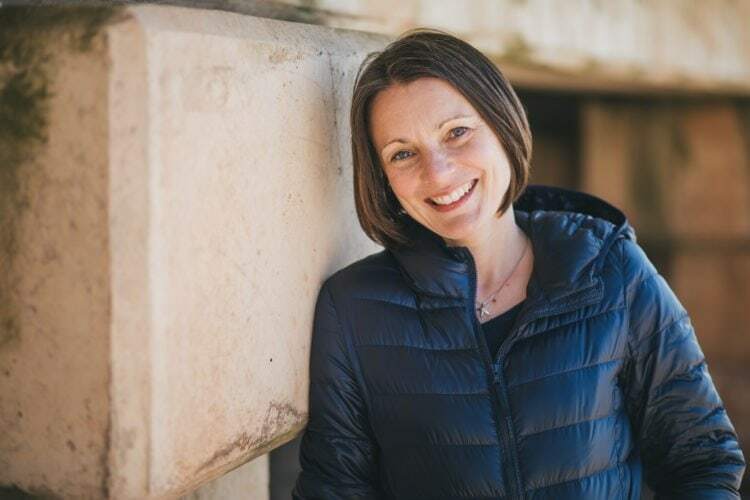 Hi Laura, so sorry for the late reply. It would be perfect just brushed with some honey or something…or use icing instead! We love marzipan so I add that but you certainly don’t need to. I hope you love it as much as we did last year! Thanks Vicki, I use a dairy free margarine which I may be able to use although I wouldn’t say it is solid. One thing to tho, the first time I made a Christmas cake I used Marg & it fell to bits when I cut it. Could I use coconut oil instead? I agree! I love this fruit cake too and could eat it every day ;)!